Walking over L’Ancresse Common, even if only looking for golf balls, one cannot escape the veritable plethora of large seemingly abandoned rocks. Many of them seem to have no reason to be there and many are grouped into circles, chambers and in one astonishing case a straight line! Until 1806 when the Braye du Valle (just south of Vale Church) was drained, Guernsey was two separate islands at high tide. Guernsey and Clos du Valle. L’Ancresse Common makes up a large part of Clos du Valle. Perhaps it is the fact that the Clos du Valle was a separate island that so many burials took place here, maybe a sort of ‘Holy Island’ thing was going on. However, we must also entertain the possibility that Guernsey had the same density of burials all over the island. Perhaps those on L’Ancresse survive due to the difficulty in shifting the stones over the ‘Braye du Valle’ and their protection due to the sand dunes that covered L’Ancresse Common after it was deforested. The name L’Ancresse is often said these days to have come about from the word ‘ancrage’ – anchorage or ancre – ‘anchor.’ But Mr. George Métivier, being quoted in MacCulloch’s Guernsey Folk Lore, refers to the area as ‘Cercle de la Plaine’, (the ‘Plain of the Circle’) which in Norse is Land Kretz. So was the area named Land Kretz by Rollo’s men in the tenth century? Certainly the stone circles on the common would have been huge in number and size with the radius of the stone circle surrounding La Varde measuring 33 feet. This huge boulder, that can only be a natural outcrop due to its size, is situated just across the road to the south of the highest point of the common that contains both La Varde and the new Millennium Stone. It is just to the left of the seventh tee (a tricky par three if you’re interested). 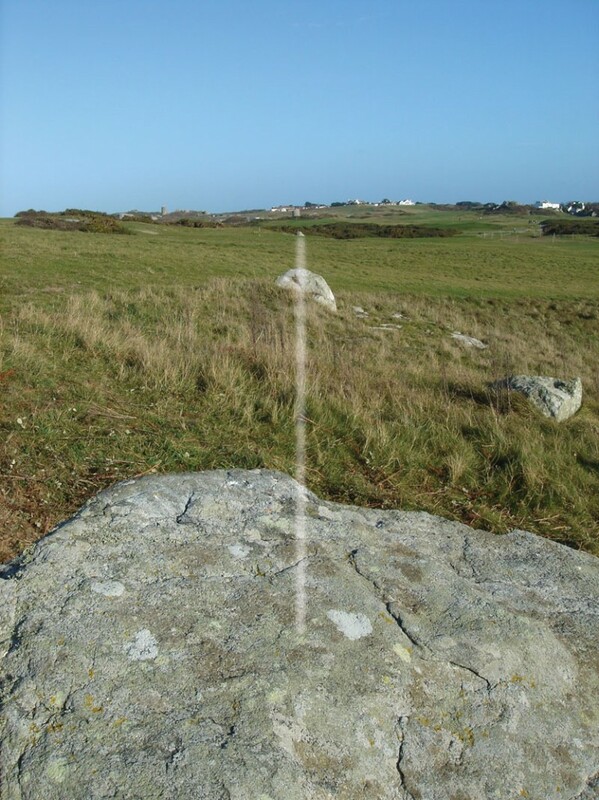 As you can see, there are three rocks in a straight line which are aligned east-west.